What I love about life is that there is always something new right around the corner (if you are open to it) that can bring you an unexpected jolt of joy. It has always been important to me to stay up-to-date on what the cool kids are doing. That’s why I subscribe to my Entertainment Weekly magazine. Even if I don’t read all of those recommended books, download the top songs or Netflix and chill with the latest TV, I at least don’t have a befuddled look of someone out of touch with the present day. Now that I no longer share a TV (silver lining of living alone! ), a whole world of pop culture has opened up to me. No, I’m still a Game of Thrones virgin, but I am completely caught up on The Unbreakable Kimmy Schmidt, fell in love with The Good Place and out of the blue, a dear friend sent me a CD that had me sobbing juicy, snotty tears. I love a good cry, don’t you? My friend, knowing that I was facing a challenging time, sent me Moana. Are you familiar with this Disney animated film? Well, you should be. Not having given birth, Disney is not usually in my wheelhouse, but my beloved friends Anna Coker hit the ball out of the park with this gift. Moana is a lovely little island girl with huge almond eyes and is destined to be the next island leader. Her father, the Chief, guides her in the ways of the land – but warns her not to ever venture beyond the reef. He paints the picture of danger and destruction and how she has everything she will ever need right there on the beautiful island. Why leave? But the ocean calls her. From the time she was a baby, she was drawn to be a wayfarer – to go to distant lands. She doesn’t want to be a bad daughter, but she also wants to follow her heart. If you’ve ever felt drawn to something MORE, but hesitated because you didn’t want to disappoint the people you love, you will LOVE Moana. I won’t tell you any more because you need to see it for yourself. And have a good cry. If you have seen the film (it came out in 2016; where have I been?! ), please let me know your thoughts. Also, have you found something NEW that brings you joy? Please share! My pop-culture “to do” list is growing by leaps and bounds, but it makes me happy. Closing thoughts on JOY and the new WOW, coming right up! Don’t be afraid to ask questions. You are worth getting answers! So as we sit in the Tampa Airport, he reading his sports page and me typing this blog post, I I chuckle to consider the host of irreconcilable differences that have been survived to date. It’s far more than his love of the Cowboys and mine of the Eagles. It’s his propensity to watch the same movies (Caddyshack, the Godfather I, II and III, Diehard and Happy Gilmore, along with Young Frankenstein and Christmas Vacation – even in the summer) over and over and over (and over) again, while I clamor to stay apprised of pop culture and the latest films, TV shows and music. He thinks if it was created after 1989, it’s irrelevant. I think the only way to STAY relevant is to know what the cool kids are watching and singing! It’s his belief that one pair of dress shoes, one casual, sneakers and sandals are the only four items of footwear ever needed in a lifetime. And his horror when MY shoes moved into his house. Ten pairs of black alone – flats, pumps, sandals, wedges, stilettos, mules, patent leather…in multiples of each. I wonder at the men who sit in lounge chairs at department stores, waiting as their wives try on outfits. Not all of them seem miserable. I wouldn’t DREAM of asking Duane to do that, nor would I have fun knowing he was unhappy every moment wasted there instead of watching the game. Before I got married, I had so many unrealistic expectations, despite well-meaning friends and family warning me that marriage was no fairy tale. The good news is, it isn’t always a nightmare and more often it is a happy, uneventful companionship that features him watching Hogans Heroes reruns while I couch dance to “The Get Down” on Netflix on my iPad. And this is how we reconcile those differences. I do my thing; he does his – sometimes we do them together and it’s all good. 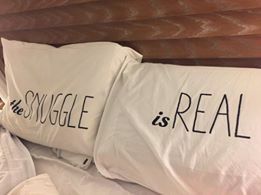 Our pillowcases say it all. Yes, the struggle is real – but so is the snuggle. I stopped being disappointed that we are so different in our tastes and ideas of what fun is and started to embrace the fact that, in our marriage, different works. Because the one thing we love more than Happy Gilmore reruns and new shoes is each other. Here are more parting thoughts on WISDOM, and the new WOW! Ah…let your heart be “LIGHT” this week. Undo those heavy burdens, and so fulfill the law of Christ – which is LOVE. Find your giggle again. Force yourself to smile. You’ll feel better. Be with people who encourage your heart. Have a light-filled week, my friends!